I promised I would share some of the holiday decorating ideas that I shared in my presentation a few weeks ago, so here is my first idea! It's a moss wreath that can be used for Christmas, but it could also be changed up and used for Spring/Summer as well. 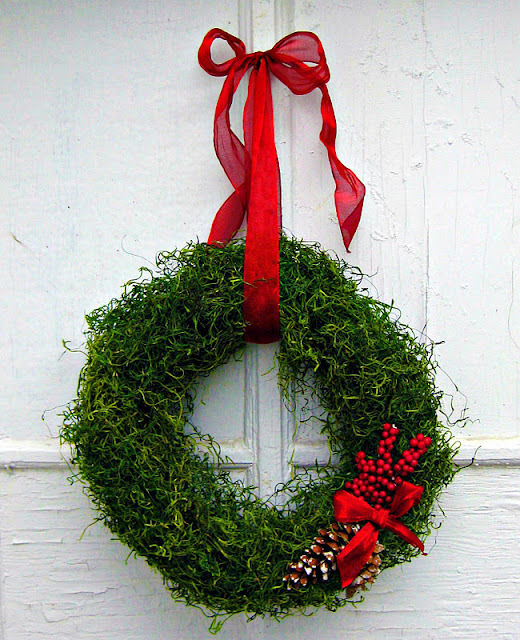 Basically, you just glue the moss onto the wreath form, covering the entire form (you don't need to do the back). 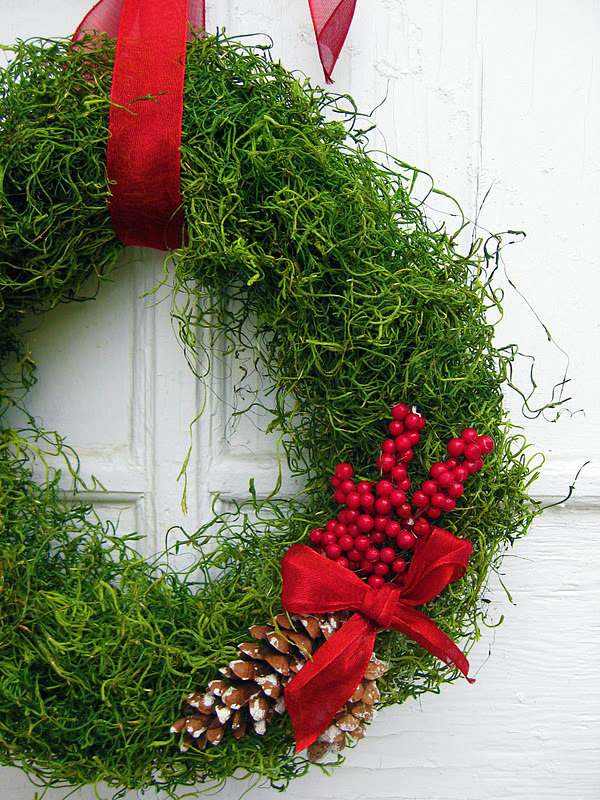 Then, glue on embellishments like berries, pinecones, ribbon, whatever your heart desires. 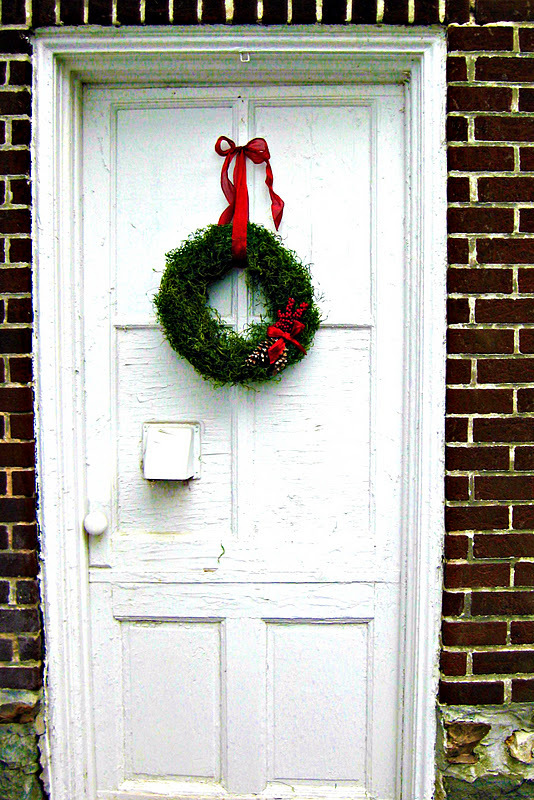 And hang the wreath by a ribbon. In the springtime, you could change the embellishments and add a bird nest with some little eggs. I wanted to save money on wreath forms, so I bought some pipe covers from the hardware section of Walmart. They came in a pack of 4 and I think the pack cost $2.97. 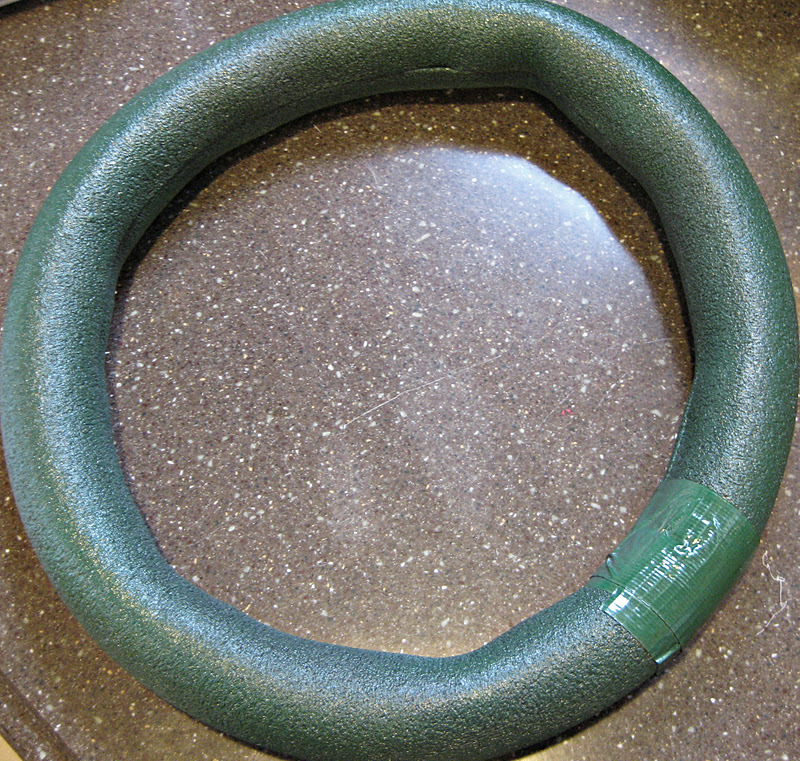 I bent them into a circle shape and duct-taped the ends together. Then spraypainted them with green paint. 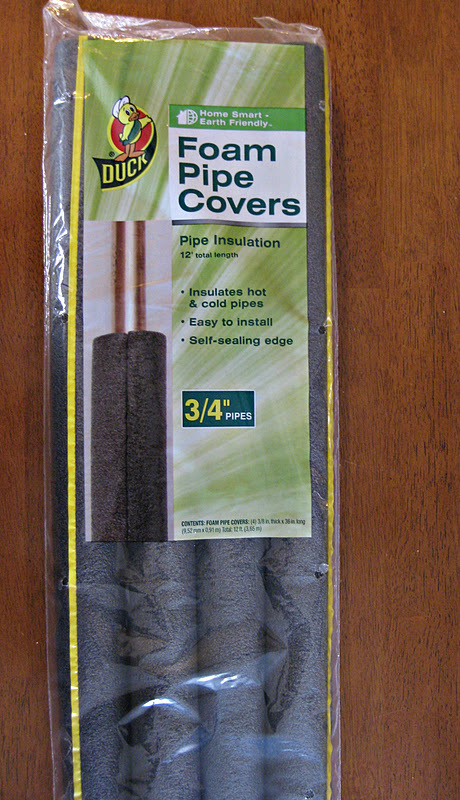 You can use these pipe covers as a substitute for foam wreath forms and use them for all kinds of wreaths. It saves you money, which I love! More decorating ideas to come! You are beyond creative and inspiring!! 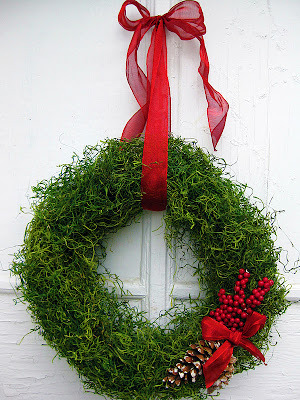 Love the pipe cover idea - would be so super easy to make a square wreath with those! 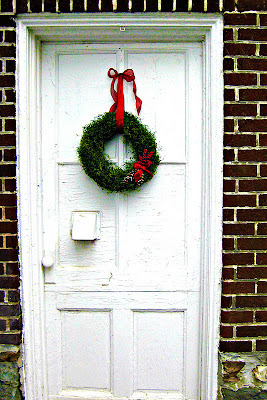 Love it, i just did post on a wreath as well-But I love yours- and looks amazing on the old door..
aimee, thanks for sharing.. seasonal wreaths..I will defintely be making this...thanks again. Great idea! Saw this over at the inspired room! :) Nice job! Love the wreath, I am definitely going to use those pipe covers! Brilliant idea! Really cute! I love the pipe cover idea! Where did you get your moss for so little? Our nursery carries it, but it's about $5 for a small bag; I don't think it would cover the wreath. I loved this idea and made two this evening. I especially loved the idea for the wreath forms using pipe covers. Thanks for posting such a fun and affordable idea! Very crafty, thanks for sharing your Christmas Decorations idea. Keep sharing awesome ideas for christmas! How awesome! Didn't know it was that easy! I see these at stores and they want $25-35. Now I can make it! Thanks! Hi there! 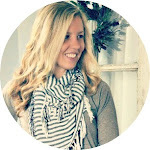 My name is Aimee Weaver ~ I'm a wife, mommy to three littles, an artist, and a lover of home projects. Here you'll find stuff about my life, lovelies that inspire me, and some of my many fun projects. Thanks for visiting! All photos and artwork © 2013 Aimee Weaver Designs.